Who is it for? Avon Glimmersticks Eyeliner Emerald is a deep green, emerald color eyeliner. 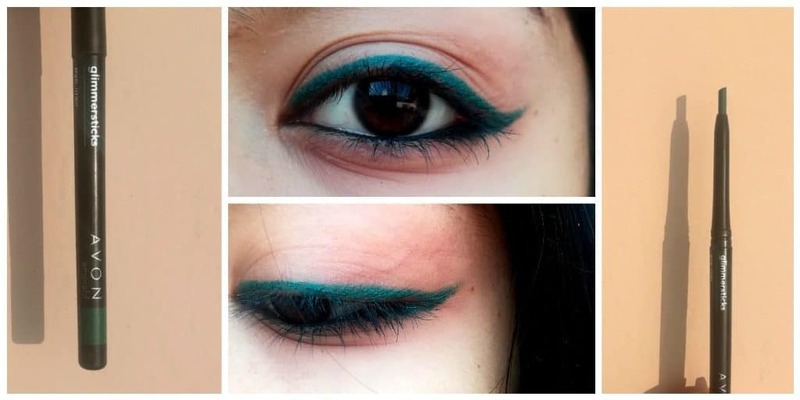 Anyone who wants to add a pop of color to their eyes can use this eyeliner. The shade is very subtle and decent but also gives the extra edge to your eyes. Open the cap of the eyeliner and roll the base for the eyeliner stick to emerge. Apply the eyeliner on the upper eyelid and create a beautiful wing. This is a retractable stick eyeliner, which is extremely easy to use. The eyeliner does not come with any outer packaging. The cap of the eyeliner is quite tight, so it won’t open if kept in a bag. The eyeliner has a retractable stick, so it doesn’t have to be sharpened every once in a while. The staying power of the product is quite good. The eyeliner doesn’t smudge at all. The color doesn’t fade after long use and stays put on your eyes. Removing the product can be a tough task. A makeup remover is an essential product while removing this eyeliner. The eyeliner, when applied to the eyelid, looks completely matte. But, the swatches show a little bit of glitter. The glitter can only be seen if one looks very closely, otherwise, the look of the eyeliner is matte. Applying the eyeliner once is enough. A double coat does provide a richer color, but one coat brings out the actual color of the eyeliner. The eyeliner doesn’t have any fragrance. What don't I like about this product? Yes, I will definitely repurchase this eyeliner. The color is extremely unique. It comes from a trusted brand and is easy to apply. I recommend this to anyone who wants to add a pop of color in their makeup. This color goes well with a lot of outfits. This is a product one would never regret buying. Avon Illuminating Face Pearls- Yay or Nay? Avon Eyeliner | Simply Pretty – or NOT that Pretty ! Avon Makeup Simply Pretty Pressed Powder is Not. Biotique Bio Fruit Whitening Lip Balm – worth it?